You can't vote for someone who is NOT eligible to be POTUS! 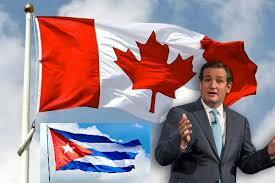 Cuban/Canadian Cruz is not "natural born" no matter how you try to spin it to justify violating the US Constitution! Mario Aouzzo, at Natural Born Citizen, presents a great detail of historical and legal evidence explaining *why* it is that Ted Cruz (*) is not, and cannot be, a natural born US citizen. Unfortunately, the majority of citizens -- including those who claim to want to restore the Republic to Constitutional governance -- do not care about the truth of the matter and do not want the truth to be known. To suppress this truth, they will and do make common-cause with the open enemies of Constitutional governance (i.e. the leftists). In other words, the American Republic is doomed ... because the vast majority of its citizens wish it to die. (*) and also why Bobby Jindal, Nikki Haley, Marco Rubio, and Barack Obama are not natural born US citizens. I can't tell you how many times -- and how carefully -- I have explained to others, using the very same line of reasoning that Mr Posner uses in the linked article, that Ted Cruz is not (and cannot be) a natural born US citizen, and those very same individuals "refute" what I have said by insisting on what I have just shown them is false. Posner: "Most important for the purposes of the Cruz question, a natural born citizen cannot be someone whose birth entitled him to citizenship because of a statute—in this case a statute that confers citizenship on a person born abroad to an American parent." Any US citizenship that Cruz has is due to an Act of Congress, specifically, due to a naturalization act: thus, Cruz is technically a naturalized US citizen (*). Had Cruz been born prior to May 24, 1934, he wouldn't even be a US citzen, unless as an adult he had chosen to be naturalized, because it was only starting then that the Congress had modified the various laws on naturalization to allow a US citizen woman to claim US citizenship to her child born abroad of a non-citizen husband. (*) Moreover, his mother didn't fill out the required paperwork until he was 16 years old; so, until he was 16, he wasn't even a US citizen at all! Thanks, Ilion, for all the additional info in your comments. God bless. He was born on the 4th of July. He graduated from Harvard University and studied law under Daniel Webster. His name was George Washington Adams. Both his father and grandfather were presidents of the United States. Yet, according to the belief of legal experts at the time he could never be president himself. Why? He was born in Berlin, Germany while his father served in the American diplomatic corps as the U.S. minister to Prussia. Keep in mind, both his mother and father were U.S. citizens. His father would soon become ambassador to the court of St. James. He would become secretary of state and not just any secretary of state, but the one who would craft and conceive of what became known as the Monroe Doctrine, the most enduring foreign policy position in American history. H[is father] would later become the sixth president of the United States and his mother, Louisa Catherine Adams, would become one of our greatest first ladies. John Quincy Adams ruled his son's life from a distance, sending letters ordering every moment of the day. Louisa, the mother, took great solace in the fact that her firstborn, George, would not have the pressure of presidential expectations. He couldn't. Their correspondence reveals their belief that the Constitution did not allow him to be president because of his birth in Germany. Writes J.J. Perling, "George Washington Adams could never have been an occupant of the Presidential chair: the Constitution of the United States restricted that office to native born citizens, and George Washington Adams had been born in Germany.""